Amazonite is blue-green microcline feldspar. This mineral is less common that other colors of the microcline. 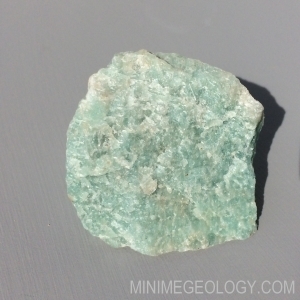 Amazonite is a popular mineral for jewelry production and collecting. Amazonite may exhibit crystal twinning and has two distinct, intersection cleavage planes. An information card with details on the mineral formation, characteristics and uses is included. Typical samples sizes are generally 1-2 inches in length or width but can vary based on availability and natural crystal shape.